From May 8 through May 14, we’ve got a special dedicated to V-E Day for you. Expect a host of surprises, including 5x XP for the first victory, discounts on regular and Premium aircraft, emblems, and various rewards for completing missions. Thanks for the info looking forward to this. Hooo boy! Time for the final push to the tier 9 262 & my American multiroles!! Hmm... maybe I should pick up the P-51K this weekend. Also, I was expecting to get my Me P.1101 next week but hey X5 dailies I'll take that quite gladly, will massively speed up progress towards it. Dang I was doing so good saving my paychecks. LOL better flush that money to the toilet. Please Wargaming, tell me again there isn't Soviet / Russian bias in your games. Cause WW2 didn't affect any other Countries did it? Edited by Buncey, 08 May 2018 - 10:38 AM. So German and Japanese planes get emblems? Did we forget who won the War? So although this is meant to be a positive and supportive thing from Wargaming I find it the opposite. This V-E Day content is fine but you developers need to refresh on history some. Yeah Germany surrendered and ended the war in Europe but everyone lumps Imperial Japan into this when they DID NOT SURRENDER until the middle of August and make it formal until the beginning of September. 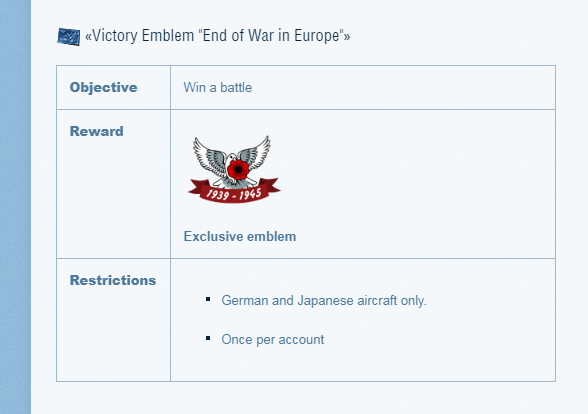 Including Japanese aircraft in the event to win emblems for the celebration of V-E day is wrong. Have you tried clearing your Cache? It has resolved most problems thus far.